Foul-ball lawsuit: Fan sues MLB over threat of flying bats, balls. 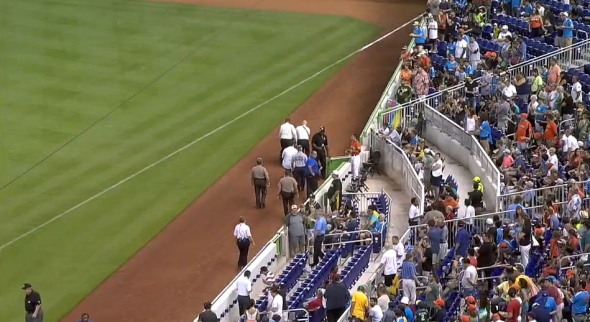 A fan who was injured by a foul ball is taken for medical treatment via wheelchair during a 2014 Miami Marlins game. The suit, filed in Federal District Court in Northern California, said that a number of factors have increased the risk of physical harm to fans in unprotected areas at ballparks: pitchers who throw harder; bats that splinter more easily; distractions like video monitors, contests, mascots and Wi-Fi that leave fans less time to react to a foul ball; and a leaguewide initiative to accelerate the pace of play. The suit says that the protective backstop netting already in place at all MLB parks should be extended along the first- and third-base lines, a reform that has reportedly been proposed by the players union during collective bargaining negotiations but rejected by owners who believe it would be a nuisance to fans in high-priced seats. A 2014 Bloomberg News study based on first-aid information from several ballparks estimated that 1,750 MLB fans are injured annually by batted balls. Broken bats are also a threat—a fan named Tonya Carpenter was hospitalized for several days after being hit in the head by one at Fenway Park on June 7. For what it’s worth, though, the Oakland fan who filed the suit sits in Section 211 of the O.co Coliseum, which appears to be well-removed from the playing field and unlikely to be struck by so many broken bats or hard-hit foul balls that constant “ducking and weaving” would be required to avoid them. The MLB suit is being litigated by a Seattle lawyer named Steve Berman from the sizable firm of Hagens Berman Sobol Shapiro; Berman previously led a concussion-related class-action suit against the NCAA whose settlement involved major changes to safety policies. He’s also representing a group of parents and players in a similar ongoing concussion suit against FIFA and several other soccer organizations.